Look no further than H & I Home Services, LLC in Phoenix, Arizona, if your concerned with your Ductwork and overall Living space. It will pinpoint the smallest airleak down to an electrical outlet. 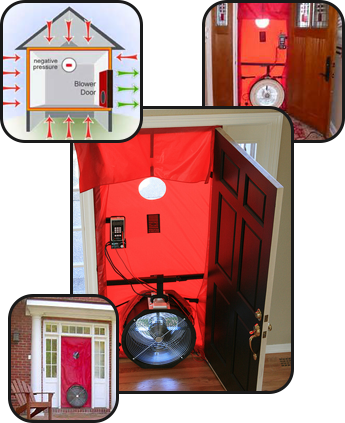 A Blower Door Test usually takes about 2 hours on average. During this time I will point out all areas of concern. Once the test is complete, I will explain the results and will offer any solutions that will help make your home more efficient and comfortable. This machine is used to measure the overall airtightness of any commercial or residential living space. It tests ductwork for air leaks and locates air leakage around windows, doors, lighting, and other parts of an establishment. Expect a drop in your electrical usage through my Blower Door Testing Solution. This service also can help resolve Hot & Cold spots and Excessive Dust infiltration issues in your home. By knowing how much of your Heating and Cooling is escaping into the attic or crawl space, you'll be able to figure out the cause of possible energy loss in your home. Ductwork - Windows - Doors - Light Switches - Outlets - Doorbells, etc.